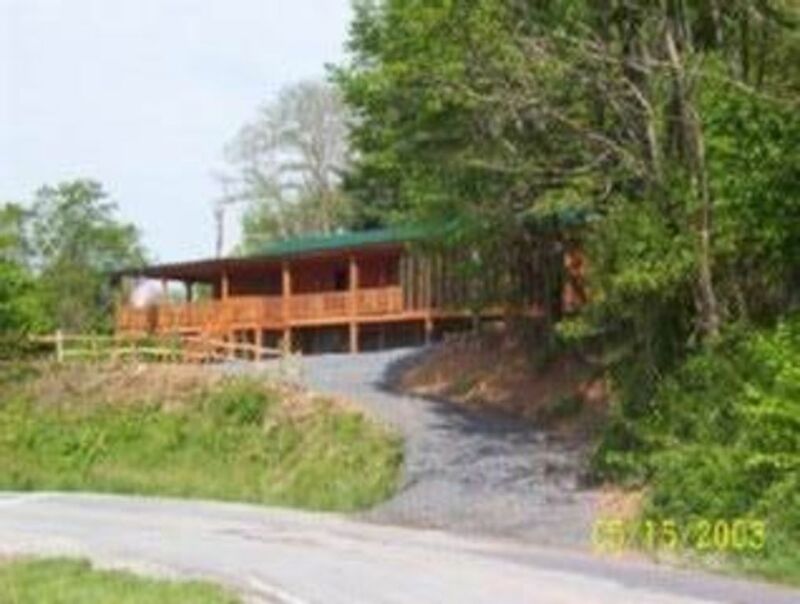 This Non-Smoking cabin is ideal for business and church groups, family reunions as well as small intimate couples or groups. We have a 900 square feet Great room which is very convenient for meetings and socializing with family and friends. One of the major draws to our cabin is the 1000 Square feet plus Covered porch. One end is screened-in and houses the spa/hot tub. There are rockers, recliner chairs, swing, and a large dining table. Plenty of room with fantastic mountain scenery. Plenty of parking. WE HAVE NEW PILLOWTOP MATTRESSES. Amenities: Gas Fireplace, Phone, Air Conditioning, Satellite TV, VCR, DVD, CD Player, Full Kitchen, Microwave, Dishwasher, Refrigerator, Ice Maker, Cooking Utensils provided. Plates, Silverware, Glassware, 10 Dining Chairs & 7 Barstools. Linens & Towels provided. Washer & Dryer, Private Hot Tub, Gas Grill (BBQ). Activities: Activities (on site or nearby): Hiking, Rock Climbing, Biking, Golf, Tennis, Basketball, Horseshoes, Miniature Golf, Amusement Parks, Fishing, Wildlife Viewing, Shopping, Restaurants, Live Theater, Sightseeing, Downhill Skiing, Cross Country Skiing, Sledding, Buckeye Lake & Recreational Area, Volleyball, Tubing. Grandfather Mountain, Linville Falls & Caverns. Whitewater Rafting, Appalachian Trail Hiking, Watauga Lake has Boat Rentals, etc. Blue Ridge Parkway. Area: We have a book in our cabin with recommendations of things to do in the area with driving directions to each of them, from quiet walking trails to whitewater rafting. From trout fishing in Summer to snow skiing in Winter. We are a fantastic vacation area all year. North Carolina mountain scenery is second to none. I grew up on the property that is now our vacation rental property. We renovated an old church building into this 4 Br. 3 Bath cabin. We now live in Knoxville, TN. We can be reached for questions at 865-385-6663. We are located on Beech Mtn. In winter it is a great Ski vacation. In Spring, Summer and Fall renters are treated to the beauty of NC mountains with cooler temperatures and a variety of things to do. We really enjoyed our stay. Everything was great and Benny was a wonderful host. Had a great time and the ski resort was just a few miles away. The property was very clean and comfortable. The accommodations were great. We had a great time. The location was good, too, for the ski sights we wanted to visit. Would recommend this property to anyone with a big family. Place was a good location in relation to hiking and skiing Beech Mountain. Place was large enough for our party. Linens were sufficient as were beds to sleep. Shop for groceries before coming in was a good tip from owner. Hot tub was very nice for achy muscles from skiing. Beech Mountain Recreation Center was 10 minutes away with lovely amenities including exercise classes, volleyball, pickleball, basketball and tennis courts. There were also several hikes nearby which one could purchase a map at the center. Beech Mountain Ski Resort was about 15 minutes away. We rented gear in off-site and this was wise as we skied Sugar mountain as well. Banner Elk was about 35 minutes away. Mast Country Store was a fun place to visit. Cabin was in a great location with plenty of room for our group of 13 adults. Beautiful view from the porch and the hot tub is a great bonus. Benny was very accommodating and even asked if we would like him to put up the Christmas tree and Christmas decorations for Christmas to which I said yes, and it was very beautiful. Only complaint from our group was you will want to have air mattresses on top of the pull-out couch beds and one other bed was somewhat uncomfortable. All in all, I would definitely stay there again. One night stays has additional charge.